The Political Winner From The Proposed NSA Changes? Rand Paul : It's All Politics The Kentucky Republican's stance against NSA data-gathering has made him a champion for those worried about federal government surveillance — among them, young voters. Kentucky Sen. Rand Paul could catch a political updraft from President Obama's decision to restrict NSA telephone data collection efforts. It's too early to gauge the political impact of President Obama's plans to tame the NSA's data-gathering effort. The full details of the proposal haven't been made public yet. But it's not too soon to say that Sen. Rand Paul, R-Ky., appears to be a winner. Paul, whose activities are fueling speculation about a 2016 presidential run, said Tuesday he didn't want to "take all the credit" for the president's decision, but the lawsuit he and others filed against the administration got Obama's attention. Ever since Edward Snowden's 2013 disclosures revealed the NSA was collecting data linked to the telephone calls of millions of innocent Americans, Paul has inveighed against those practices. His stance has turned him into a champion for voters worried about federal government surveillance — especially young voters. Polls consistently show that it's under-30 voters who are the most concerned about the NSA's activities. 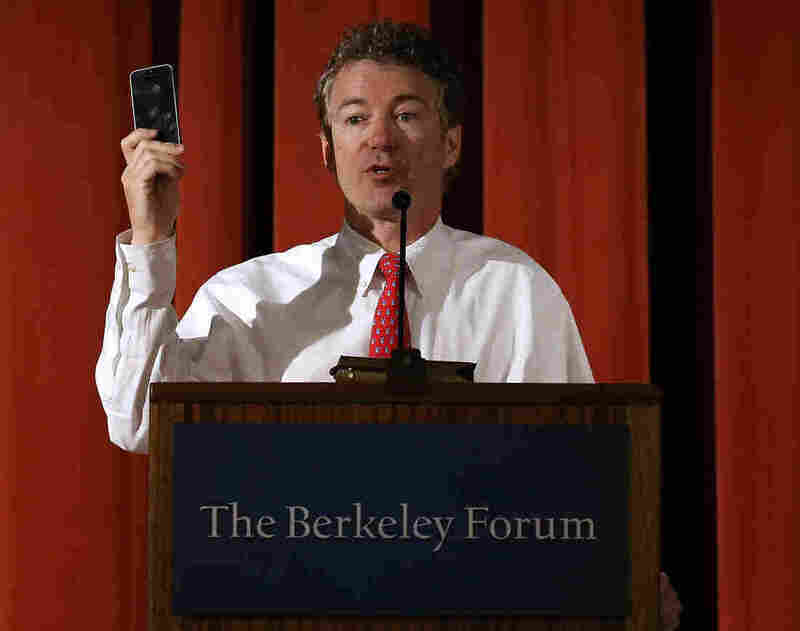 At a recent speech at the University of California, Berkeley — a liberal stronghold — where he castigated Obama for the NSA surveillance, Paul became the rare Republican to receive a warm reception. Not only does Paul get to claim he helped push the administration toward a policy change many Americans desired, but he also increases his stature among young voters by being out front on an issue they follow closely. "Young voters are certainly the most concerned about this of anyone, and Sen. Paul has been out speaking on this issue for a while now," Doug Stafford, executive director of Rand PAC, told It's All Politics. "I think he certainly has helped bring this issue to the forefront. And I think he can claim no small part in the fact that it's being addressed. Whether it's going to be addressed to everybody's satisfaction, we'll withhold judgment on. But the fact that it is being addressed is in no small part due to the attention he's brought to the issue." Young voters, of course, aren't the only ones who care deeply about the NSA surveillance issue. It also matters a great deal to those in the Tea Party and libertarians. Paul could already lay claim to many of those voters, but the president's move to rein in the NSA certainly seems likely to energize those voters to the Kentucky senator's benefit rather than rally them to Obama's side. Many Democrats will also welcome the president's decision — not only because of the implications for civil liberties. Democrats certainly didn't need anything that would further discourage young voters from going to the polls. The president's NSA decision wasn't made solely or even mostly for political reasons. But one of the potential spinoff benefits of responding to criticisms of NSA data-collecting is that it could defuse the issue.